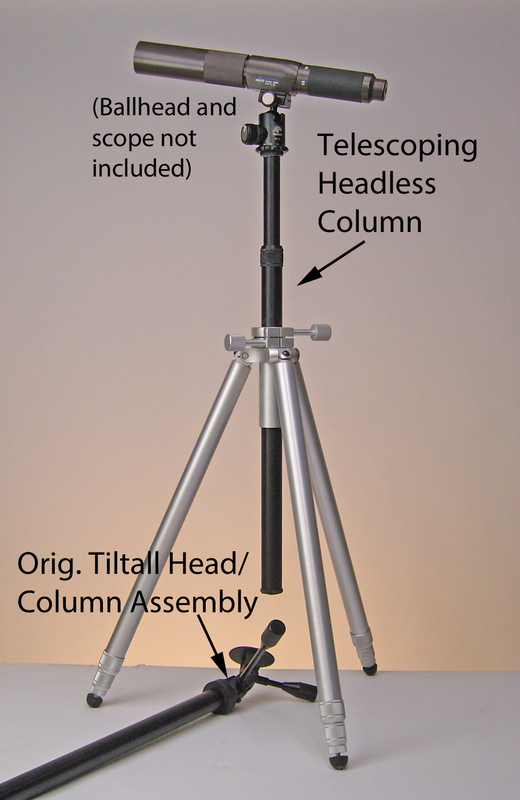 A - The original stock Tiltall head and column assembly - seemed to have gone missing in your photo of your Tiltall - often considered too complicated for easy travel and "bush" work - handles however can be carried inside the length of the current center column and hidden out of the way. B - a telescoping and headless column made from one leg of the TILTALL - increases column length by 18 inches - meaning a birder could extend the column to comfortable eye level, but not need to extend the three legs as much as with the normal head and column - so much less tripod foot print around your feet. See an earlier "birder" prototype post. For a photographer one could extend the column and legs 18 inches higher than the original - OK for smaller cameras, not OK for that 4x5 field camera (am I showing my age?). I expect to have this monocolumn available by the end of the year - expected price $55 with shipping - pre orders $45 with shipping. C - Headless column - you choose the articulating device (monoball, other brand tripod head) - usually more compact than the original head design - same length column as original - 3/8-16 thread right and "top" end, 1/4-20 thread on left and "bottom" end - this is a black prototype similar to my run of a silver headless column which has sold out and I am not planning to do another production run. 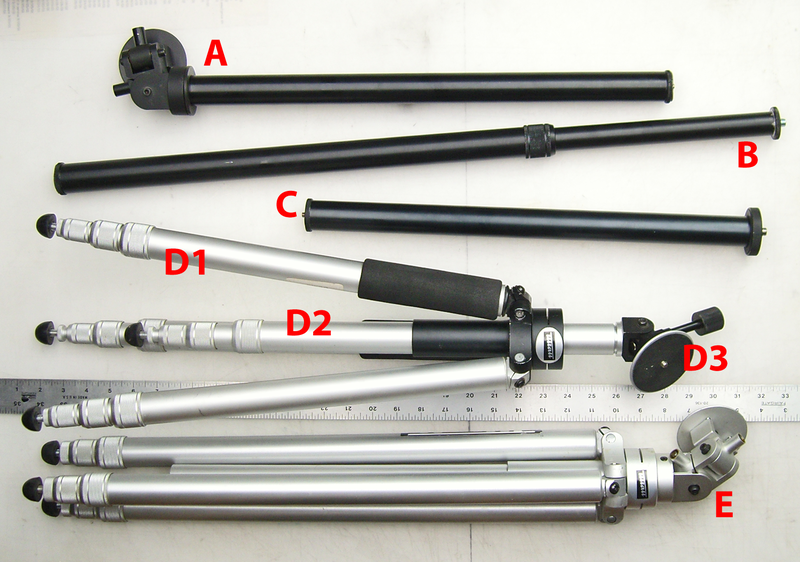 D - a very hybrid TILTALL using KingHome "Tiltall" four section "monopods" for both its column (D2) and three supporting legs (D1) - the center column could be reversed as "B" above extended to another four feet longer than "B" - also note the altered one handled camera platform - this would be smaller and less expensive if one was only using a scope or video cameras - rather than cameras where you do NOT need the second 90degree gimbal. Completely a concept piece with no expectation of production. E - Standard TITTALL included for comparision of length with all the items above it. 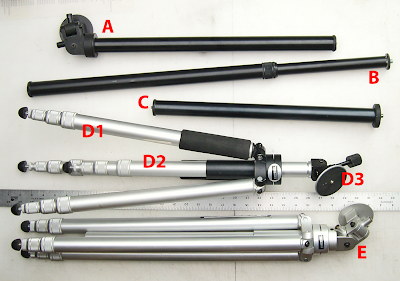 Last note: maybe hard to visualize, but "D" can be used as a video motion stablizer - extending the center column as a monopod and extending the three legs laterally as balance arms - I said "hard to visualize" - see my earlier design Handipod. Thanks for your interest in scope use - your timing was good. Photo below - Telescoping center column installed with scope. Click on any photo for enlargement.